This mousepad is made from my original oil pastel drawing. It’s Giuseppe and Mr. Sunshine, just quietly hanging together on the landing, Giuseppe sitting upright, Sunshine loafing. I know they are both aware of me because several ears are turned my way, yet they have no intention of giving me the time of day or anything else by turning to look at me. The mousepad is 7-3/4″ x 9-1/8″ and is made from stain-resistant high density foam, nicely cushioned and just right for any type of mouse to smoothly roll over the surface. 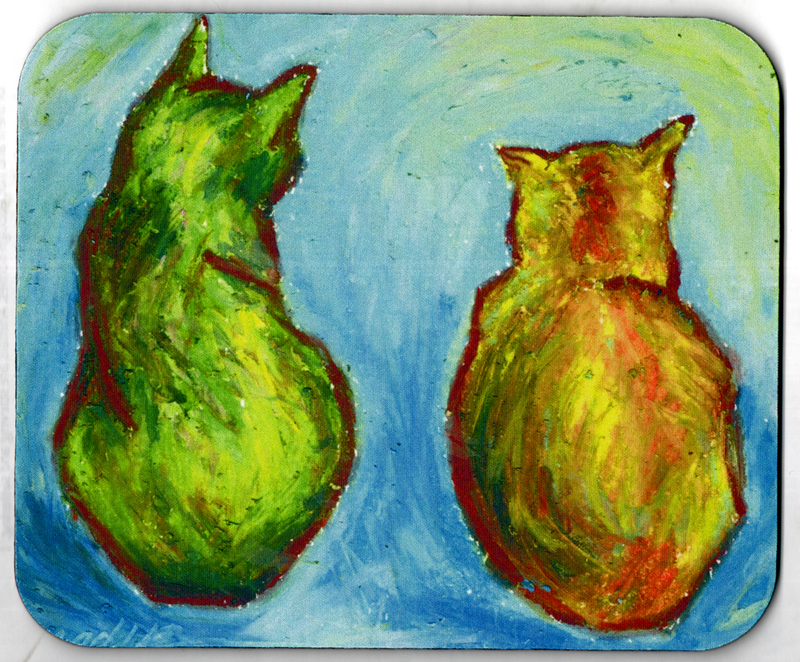 I was so taken by the exhibit “Van Gogh Close Up” that I began visualizing sketches of my cats and other things in techniques and colors that van Gogh may have used, the thick impasto of the paint, the contrasting outlines of figures and bright bold non-objective colors The first of these was “Two Cats After van Gogh”, using oil pastel to create the layered impasto and texture. I also have other keepsake boxes and gift items with other images in this style such as “Mimi on the Windowsill “, “Sunshine in Colors”, and “Kelly’s Yellow Bath”. Please search my shop for those titles to see the items I offer with those images. This entry was posted on April 10, 2016 by Bernadette.